Home > VoIP Support FAQ > Domain Names > How do I set up Web Forwarding for my Domain? How do I set up Web Forwarding for my Domain? Our service offers a Web Forwarding service which allows you to send visitors of your domain to another website. To enable Web Forwarding for your domain, simply log into your Dashboard, go to your Domain list and click the pencil to edit your domain. You can then select Web and Email Services from the tabs that appear below, and click Add Forward beside Web Forwarding. From here you can assign another website for the visitor of your domain to be directed to. 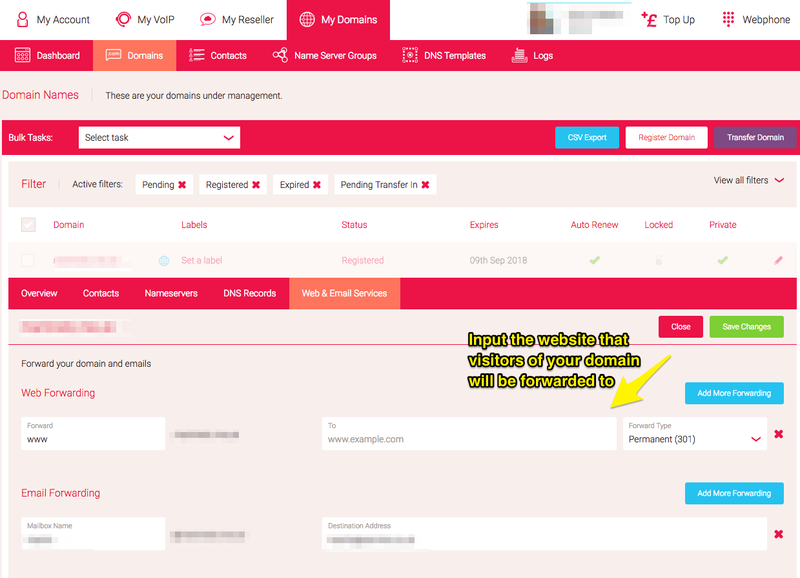 For example if you want to have ‘blog.mydomain.com’ forwarding to one place, but the main domain (‘mydomain.com’) forwarding to somewhere else, you can do this by adding multiple Web Forwards and setting the ‘Forward’ field to ‘blog’ and ‘@’ (root) as necessary.